Notre Dame quarterbacks simply make too many mistakes under Brian Kelly. The same old failing came back to haunt them against USC with three critical turnovers at vital times. Kelly came to Notre Dame with a much vaunted reputation o f making good quarterbacks great. So far he is doing the opposite it seems. The three turnovers speak to a lack of discipline, not just by the players but by the coaches too. Dayne Crist fumbled on the one yard line with Notre Dame preparing to draw level and USC ran it all the way back. . It was inexcusable, sloppy and we can blame the coach too. Tommy Rees gave away two critical turnovers, the first a strange lateral to Ciera Wood that USC pounced on, the second a throw to Floyd in a crowd of players that was picked off. These were the turning points in the game, a heavy loss to USC. There was also the strange decision to insert Andrew Hendrix at a key moment after the irish had returned a kick off for a touchdown and looked like they were on the way back. Instead Kelly mysteriously inserted Hendrix who failed to move the team and almost threw an interception. What is with Kelly and his mistake prone quarterbacks? 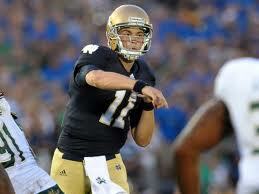 Fact is unless his quarterbacks improve the Irish will never be a BCS threat. That is obvious after the USC blow out.